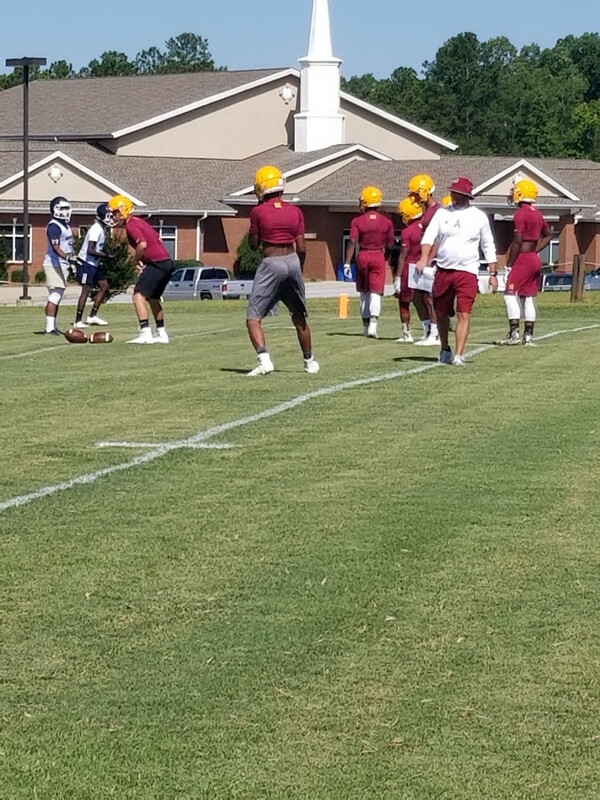 Sunshine and blue skies was the perfect backdrop for the Abbeville High School FCA 7 on 7 scrimmage, that took place Tuesday morning. Eight teams made the trip to A-Town to work on their passing, route running, catching and defensive pass coverage skills. The day started at 9am with all of the teams participating in a devotion at Grace United Methodist Church. After the devotion the teams made their way to the practice field, which four teams used, and onto the hallowed grounds of Hite Stadium-Dennis Botts Field, which the other four teams played on. Crescent, McCormick, Ninety Six, Lincoln Co., Strom Thurmond, Seneca, Newberry and Abbeville participated. Malik Washington on the very first play for a 50 yard touchdown pass. The sidelines erupted as Washington beat his defender and Jackson dropped a beautifully thrown tight spiral into the hands of Washington. Former Panther great, and current Dallas Cowboy, Keenan Gilchrist was on hand and jumped up with excitement. “He’s droppin’ dimes. Man that was so pretty” Gilchrist gloated about the Jackson touchdown pass. Abbeville went on to defeat McCormick 21-0 in the first quick session. 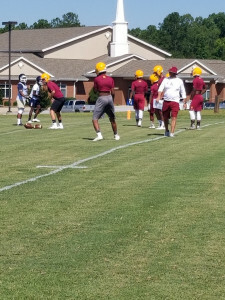 Abbeville then scrimmaged Seneca. A couple dropped passes stalled the first two drives. Dooley Sanders caught the only touchdown in the second session versus the Bobcats. Seneca has a Clemson target, a strapping 6’5″ 210lb tight end Braden Galloway that caught the game tying touchdown on a fade route. Abbeville defensive coordinator and athletic director Tad Dubose was quick to point out to the Panther defender how and why he got beat. He demonstrated how to defend that particular route, and that ended the scrimmage tied at 7. The Panthers then faced long time foe, Lincoln County Red Devils. The Red Devils will be making a trip back to Abbeville for a regular season game on September 8th. You might want to go ahead and sit out your chairs for that one. The one glaring thing I noticed about Lincolnton was that last years team, looked a good bit bigger. Now, don’t get that distorted. They are big and fast and talented. They always are. They just didn’t look as big, at the skill positions as they did a season ago. The Panthers dropped two touchdown passes, and gave up a long touchdown to the Red Devils and that scrimmage ended with LC taking a 7-0 win. Abbeville head coach Jamie Nickles was playing the part of coordinator. Not offensive or defensive coordinator, he was more of an event coordinator on Tuesday. He kept up with the time, directed which team to go where and of course he kept track with the all important lunch break which was catered by Chic-Fil-A. The Panthers will participate in summer workouts on Wednesday before hitting the practice field again on Thursday of this week. They will take the week of July 4th off before reconvening on July 10 for the last two weeks of summer workouts and practices. The Panthers will host the WCTEL Kickoff Classic on August 4th at Hite Stadium. The regular season will start on August 18th with the first game being at Ninety Six.